Today, most professionals like you and having in-demand skill sets are looking towards a future that entails financial security and independence. As we had seen in the last post, the world is moving towards freelancing and independent contracting. Freelancing comes with its own set of challenges, especially for those who are new to it. We will be addressing these challenges and suggestions to get over them, in a series of blog posts. 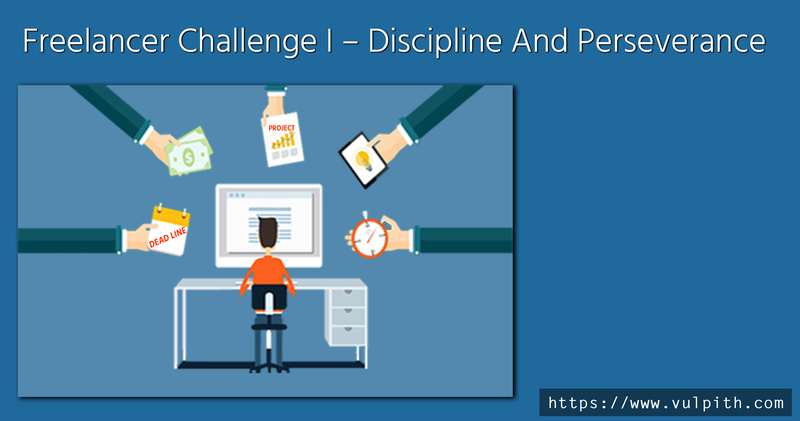 In this post, we will discuss the first challenge which is discipline and perseverance. Why is discipline a challenge? Most freelancers who just start out have either come out of a day job or a business involving hectic day-to-day schedules. One is used to the timetable and a sudden exit brings a state of relaxation, understandably so. When the objective is to be a freelancer or an independent contractor, it is important to focus on building the business step by step. As all of us are seasoned professionals the importance of building an income stream is not lost on us. However, most freelancers tend to take it a little easy because they get into the “I am my own master” mode. When one is the master of self, it takes more to subsist than being a slave, obviously, paychecks have stopped coming by. I have seen freelancers working in coffee shops, in their shorts, on the beach and even on a nature trail, especially those who offer IT services like web design, software development or business related services like presentations, legalese or any such services that do not warrant physical presence. The independence you get with freelancing is commendable, however, do you have a schedule, do you have a policy or a strategy that ensures timely delivery, and finally, do you have returning clients? The major fallouts of lack of discipline are missed deadlines which no client would accept and lead to inconsistent financial inflows, wasted time and more marketing efforts to find new clients while returning clients dwindle. This is not an appreciable situation for any business. If you are disciplined enough to be a freelancer, how do you expect to build and run a big business? The first mantra is to follow a set schedule. If you are a SOHO (Small Office Home Office) freelancer and concerned about domestic noise, you can dedicate a small room for your work. Or, if you lack space, you can look at working outdoors like lake-side, parks, Café Coffee Days, McDonald’s outlets and so on. Today, the challenge of fast internet connectivity is no more with 4G enabled mobile phones and low-cost internet tariffs. When you grow a little and need to hire people, you can consider getting a small independent low-cost den for yourself. Enhance your focus and concentration abilities through yoga or any other means of improving your efficiency. You need to give more to your business than what you have given your employer in the past. Just because you have time on your hands, do not get involved heavily in sociability or social media. Use the time wisely for putting in more efforts into getting more customers or bettering your services. You can also opt to learn new skills that will supplement your present service offering. This is the quality that you must have all times. The difference between you and a successful freelancer is that the successful one has lost more proposals than you and failed many times than you have. Remember, getting those first clients is not easy and keeping the cycle going also take considerable effort. I know people who have given up on freelancing after giving it two months and stated with finality that “You cannot earn money freelancing online”. That has actually motivated me to be successful. It took me just over 2 months to land the first unknown client. That is when I realized the satisfaction derived from my efforts, by delivering on time and collecting money. The icing on the cake was that he recommended me to 3 others who opted for my services immediately. The secret is not to give up. Keep pursuing clients until you succeed time and again. It is an art and you will evolve when you realize that you have a success rate of over 50%. So, stay in the loop and keep boiling the broth. In conclusion, freelancing is a means to offer your skills and experience to clients and learn/improve from the experiences. It is advisable to take small breaks between projects after you finish one successfully and take on the next one. This will keep you rejuvenated and motivated. A successful freelancer is the one who loses more projects at the proposal stage and not the one that fails to deliver the projects taken up. Freelancing is a career and should become a way of life. It is certainly not a shortcut to earn quick money. Discipline and perseverance are the most important qualities a freelancer should have. In the coming posts, we will talk about many other problems that freelancers face. We will be discussing these, one after another in this series of blog posts. Keep reading and learning.